Leroy (18 years old) is a happy monkey in his special space. Welcome once again to the Primate Care site. In my last post I spoke about toys and many of the safety issues surrounding using them for monkeys. I wanted to speak more about building a safe and happy place for your monkey but first I am writing about the importance of setting up an extra savings account for your monkey. This special account will allow you to comfortably cover vet bills and other important needs that will arise for your baby monkey in the months and years that follow. We as monkey caregivers seem to experience many of the same things that parents of human children do. 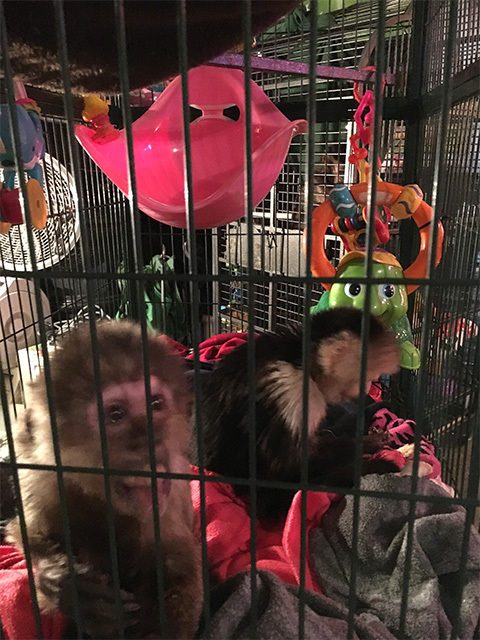 We begin to get all excited about our new monkey coming and begin to collect toys, diapers, diaper covers, clothes, monkey bottles and blankets, and of course, their travel cage and then their play cage. Many of you who will be getting a monkey may already be part of a group of monkey caregivers, or have a friend that has a monkey or you may be choosing to get your information about caring for a monkey from this site. After reading this post I hope that many of you will wish to know more about my book called “Living With Monkeys.” You will not only find out the way to purchase the book there but you will also get more information about it on this site too. We wish for you to be informed and not be surprised when you make your big decision about getting a monkey. Being totally prepared and peaceful with your decision will make for the best possible outcome. This important account needs to be plentiful in case of a monkey emergency such as an accident or an illness that might occur. The needs of a monkey can change from one day to the next. Without a “A Monkey Care Bank Account” you could find yourself in deep debt in order to meet their needs. “A Monkey Care Bank Account” Is Not A Credit Card: None of us wish to not be able to pay for the big things that could or might happen to our monkeys. This is why I recommend having the price of your monkey that you are going to pay and at least another half of that price held in your special “Monkey Care Bank Account” and choose to add frequently to that account whenever possible. The vet bills for a sick monkey can run unbelievably high as well as medical procedures such as spaying or neutering a monkey. As we have learned from our readers of the Primate Care Site, there are all different types of people from all types of walks of life who like to stop by and read our information on our site about living and caring for monkeys. 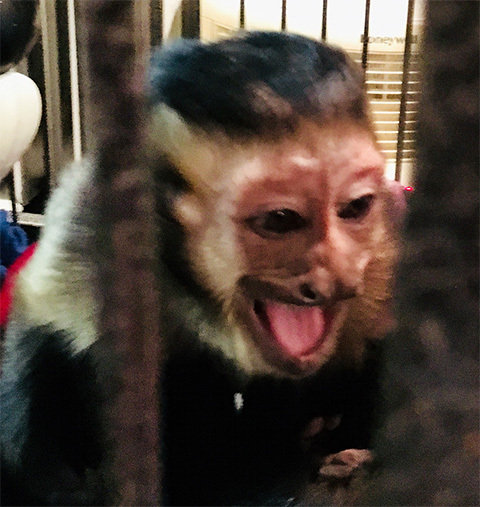 If you are a new reader to our site we are so glad to have you and hope you will stop by frequently to learn more about becoming a monkey caregiver. For you regular readers who visit us often we just wanted to say thank you for continuing to visit us regularly. Sometimes, we feel that it is important to bring things to the attention of the new readers that may possibly turn out to be future monkey caregivers. This is one of those times. The following words that I have written are very important things to think about when making your decision to be a monkey caregiver of a pet monkey in your home. Many people have wanted to be monkey owners for a very long time and then one day they truly begin to try to make that happen for themselves. Reading and studying is such an important thing to do before you make the life changing choice about getting a monkey. 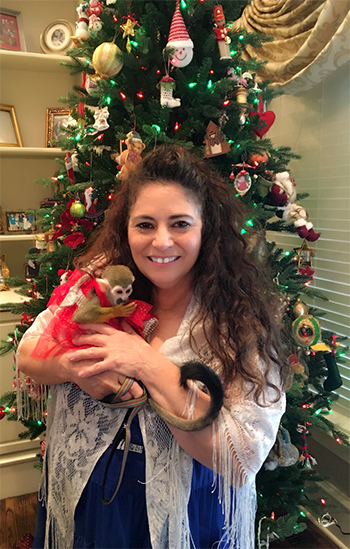 In my thirty years of living with monkeys, I have only had about nine years of working and networking with other pet monkey caregivers. My early knowledge of living with monkeys was very different with a very different type of educator, but due to this, I have always thought that it has helped me be able to give a very different slant on helping people be the best that they can be as monkey caregivers. I have seen many people choose to use their income tax money, government back pay of SSA checks, inheritance, company bonuses, or many other different type of extra money to buy a monkey with. By the way, monkey prices have reached an all time high. You can now spend $8,500 to $9,000 to buy a female Black-Cap Capuchin baby monkey or even more. The rates for one has doubled in the last ten years. If you do not have the lifestyle to support having an exotic monkey, even though you have the money from an inheritance or wind-fall; please seriously consider these important words that I have written about having “A Monkey Care Bank Account.” I have seen people that did not know about having an account like this and when a great sickness came upon them with their monkey they had to be heavily burdened not only with their precious sick monkey but they were worried about the debt for the vet expenses. Yes, we now must all live with many uncertainties and move forward in life never knowing what is going to happen in our lives that might alter our directions and plans in life. May I suggest that if you are already struggling to keep your head above water (on a month to month basis or your funds are very low each month) – PLEASE GIVE CAREFUL CONSIDERATION BEFORE SIGNING ON TO PURCHASE A MONKEY. Please continue to listen for that all important peaceful guidance, when making your decision about having a monkey. 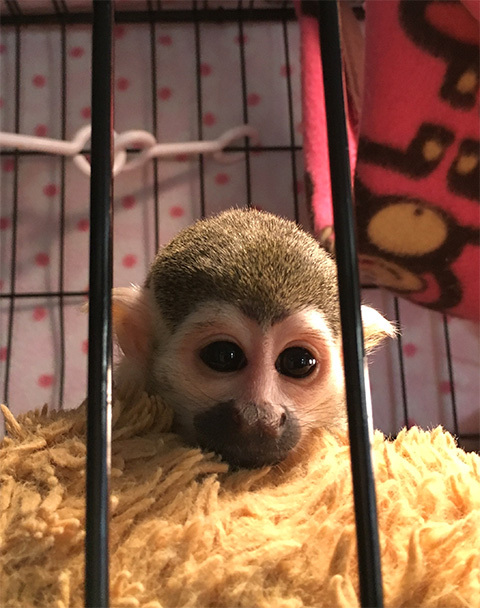 Many People Are Now Choosing To Leave The Proceeds Of Their “Monkey Care Bank Account” With The Families or Sanctuary That They Leave Their Monkey To In The Case Of Their Deaths. I wish for you to always be placing money away in your “Monkey Care Bank Account” for the unexpected things that your precious monkey may need. There will be a day that you are so glad that you did this. During my years of having monkeys I have not shared photos of my facility very often. I think one of the reasons that this is true is that I have never spent a great deal of money on their habitats. But for this posting I felt that it would be helpful to share how I have inexpensively made their habitats full of colorful things. So, now, it is time to move forward with learning how to build a habitat that will be inexpensive, fun and safe. I am a monkey caregiver who believes in spending the least amount of money on the fancy stuff for my monkeys. This decision to be this type of monkey caregiver began due to my early lifestyle with having several monkeys while traveling and living with them in my rolling home. Although my lifestyle has changed to a more natural type of life with monkeys, I still hold onto many of the original things that I used from the very beginning of being a monkey caregiver. The habitats for a smaller type of monkey or a baby monkey are in most cases the same as they are for the larger monkeys. The main difference is that everything is smaller in size such as toys, hammocks, size of cage wire, and the size of their blankets. These are a very important part of the lives of my monkeys. 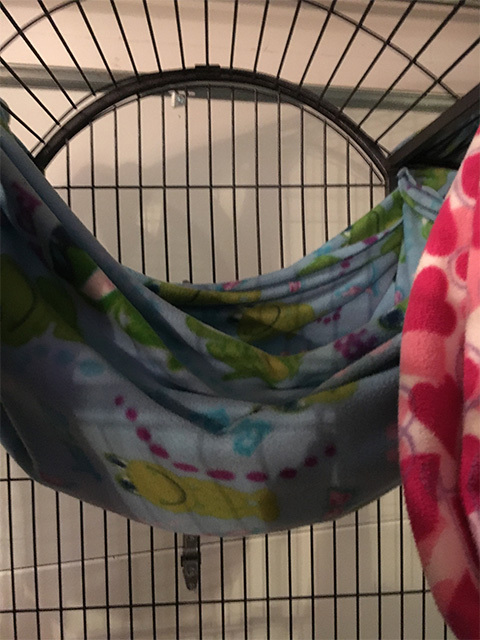 They serve as warm cover for them to snuggle in hammocks, carry slings for them be be placed in when they are out with me in the house, and they even serve as a soft place for them to land on the bottoms of their cage. I purchase these blankets in different places and keep my supply of them constantly available due to the importance of having them for my monkeys. A monkey blanket can be a nice old thrift store house coat, blanket or just a nice piece of remnant blanket fabric. Many times I will go to Walmart for sales on blankets or nice pieces of remnant blanket fabric. It is also wonderful to go to garage sales and church sales to shop for these usable monkey blankets. Blankets That Have The Zigzag Threads On Them: I am constantly taking the time to pull the zigzag type made from heavy thread that comes around the outside of many of the blankets. This is because I do not wish for an accident to happen with one of the blankets having this type of thread on it. Many of my monkeys wish to take these threads from the blankets and will begin to wrap these threads around their toys. I have heard of monkeys using these strong threads to wrap around their fingers. So, this is a very important chore that I wish to do often for my monks. Blankets Make Great Hammocks: No matter what size of cage you have, a blanket can make a great hammock for your monkey. 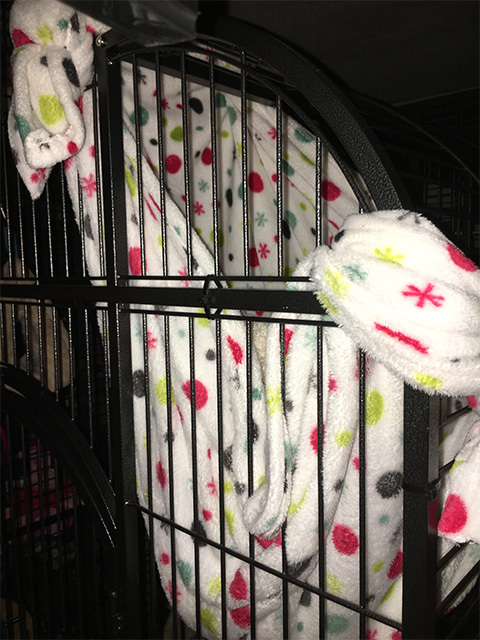 The thicker blankets are great for the larger spacing of the wires of your cages and then the thinner style blankets are easier to use for the thinner wired cages. Several years ago I had someone also show me that you can use sheets to also make into hammocks. These are great for cages that are outdoors too. 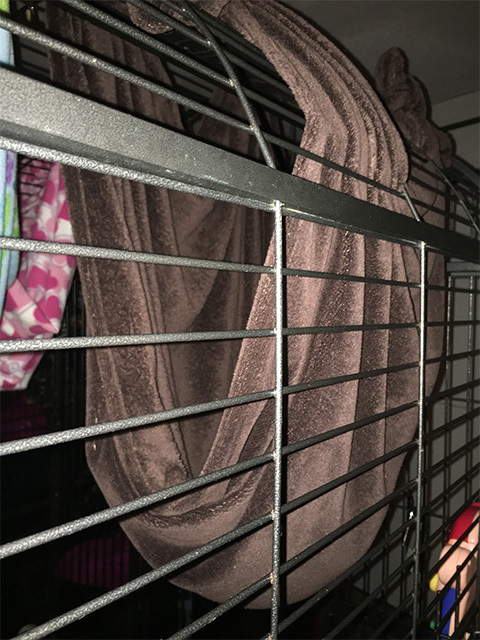 How To Use Blankets For Baby Or Smaller Monkeys Breeds: When I use a blanket for a smaller breed of monkey or a baby monkey, I make sure that the way I tie the hammock is a safe distance from the light on their small cages and of course, the electric cord is safely tucked away under one of the outside cover blankets. When building these smaller monkey habitats, I also use a very small metal piece of mesh up under the light to keep little fingers from getting to close to the light bulb when they are moving around in their cages. I believe that it is very important to have a little play cage for all baby monkeys. This cage will help them learn how to love and nurture themselves when you need to have time away from them. 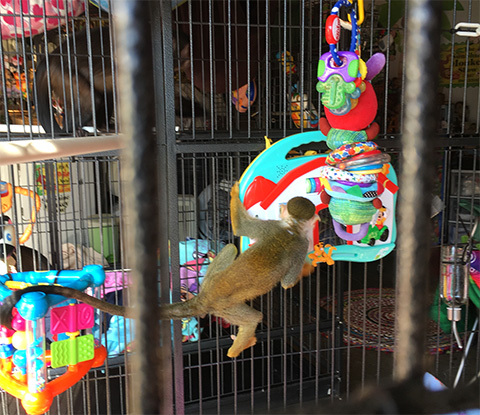 Having this cage is not only important for your baby or small breed of monkey; it is as important to you as it is to them. It is equally important for you to have time away from your monkey as it is for them. Many people begin to have unhealthy thinking about not leaving a monkey when they are little babies. I believe it is important for all monkeys to learn how to be by themselves. This small cage is best for them when it is placed high up from the ground at least waist or thigh high. They should be able to look out and see their environment and begin to feel safe in this space. 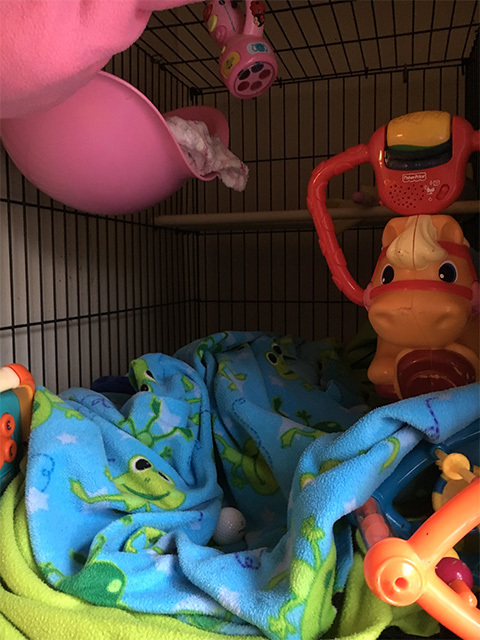 Stuffies and their favorite blankets or toys should be used in this cage – everything that you feel will help them enjoy their time in this cage. The wire of course, should be spaced close together such as a medium size bird cage. The closeness of the spacing of the bars (or wires) on the cage is an extra safety for the small breeds or baby monkeys. 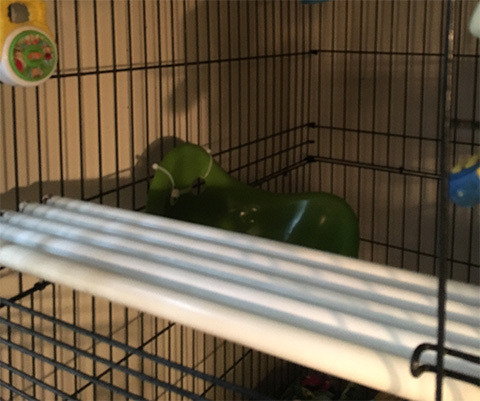 In order to make the cage even more comfortable it is great when you can put a nice light colored blanket around the backside of the cage. It also should be pulled up a safe distance from the light fixture so that the cord can be out of sight from the monkey. I hope the photos have been helpful as I have given you readers the information. Many baby monkeys come on Stuffies so remember that you will be placing this in the cages with them. Choose the toys that will be in them from the toy guidelines that we showed you in the previous toy post. Always hang things low towards the bottom so that they do not hurt them when and if they fall. Some baby monkeys come very active and then others come very sleepy and shy. Many will come acting as if they enjoy their thumb or hanging on to their Stuffies more than they like you. The main thing to remember when you are leaving your monkey by themselves in their play cage is that you must feel comfortable and at peace. I believe that our animals are always reading our energy and our pictures that we make in our minds. So, is is very important to be at peace when we are getting ready to leave our monkeys. If you do not like leaving them with a hammock or blanket in their cage, then take it out. The most important thing is for you to feel peaceful and to be able to leave showing your monkey or other animal that you are peaceful. I believe that wrapping our loved ones in peace is a very important thing for us to do as we are saying goodbye. The Stuffie Issue: Stuffies are stuffed toys, like a dog, cat, monkey, or it can even be a blanket that works the same way. The breeder often places them on one of these types of Stuffies while they are feeling the things around them. They will cling to this and feel safe and secure while they are hanging or holding onto it. While they are on the Stuffie they will be happy monkeys but when you try to pull them from this they will show you how heart-broken that they are and cry to be back upon their wonderful Stuffie. Some monkeys do not come on a Stuffie but will soon begin to use your arm or arms, shoulders, head or even wrap themselves around your ankle. They are looking for a substitute for their normal thing, which would be the back of their mother or other troop members. But soon your baby monkey will begin to choose to be with you as they learn soon who is their monkey caregiver. I like to keep changing things up with them when they come, like using a blanket instead of their Stuffie to feed them their milk or gently pull them from my arm to a Stuffie. The main thing is to change things so they will not just take one type of Stuffie or one type of blanket. This will also save you money in trying to buy more of what they love. They will soon learn that they love it all and whatever you choose will start being a happy thing for them. STORY TIME: In October, I was brought a lovely little Squirrel monkey to love and care for. I listened closely to everything that they were telling me and began caring for the little girl just as they had suggested. They had trained her to come to the Stuffie when she was running through the house and to get her diapers placed on her on the back of her special Stuffie. At first I thought that this was a good thing but I soon began to process this and realized that in my world this was a mixed thing of good and bad so I went out shopping for little, smaller sizes of her favorite thing, her hairy “Puppy Dog Stuffie.” It was much easier to change her to other puppies than I thought it was going to be. The former family performed a wonderful job of teaching the little Kizzy to be diapered, wear clothes and all of the necessary things. It made it easy to become her new mom. I did find out (the hard way though) about a diaper-less Squirrel monkey. These little monkeys are jumping and eating and shooing every jump. They are very messy little things. I was so glad that I had the great idea of getting all different sizes of Stuffies for her due to the constant need to clean her cage. The big mistake that I made was to change the way they diapered her on top of her Stuffie. Oh, ‘yes,’ I had the bright idea that it would be hard for me to constantly have a treat ready to give to her after she was changed on the Stuffie, plus I knew it was equally going to be even more difficult to get a treat ready every time I wanted to put her diaper and belly band on around the other monkeys. They would also wish to have a treat every time they were diapered and tethered so I dropped using the Stuffie and the treat for diapering her. This turned out to be a very bad idea for little Kizzy. She is currently being trained all over again to a new way of doing this diapering thing…..ugh. Bless both of our hearts. A Really Big Thing To Remember: We make mistakes all of the times when living with monkeys in our homes. When things are not working please do not continue to do the same thing over and over again, expecting it to work or there to be a change. Stop what you are doing and try to do it differently until you come upon the perfect thing that works. Monkeys are not like any other animal and certainly not like children either. When baby monkeys are learning so many things such as good manners, limits and boundaries, and such important things like their early life in captivity programming, they can become overwhelmed when they are put into a cage that is much to large for them. All of these things are very important as you are raising a monkey when it is young. Not only will the book help you understand about these thing that I have mentioned but the many posting here on The Primate Care site will help you too. 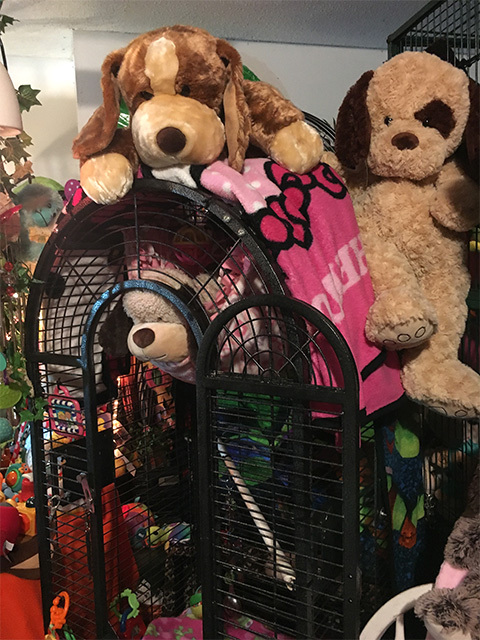 Many Of My Cages Have Come From People Who Wished To Sell Them: Even when I have needed cages, I have been very lucky to find exactly the right cage from “Craigslist,” garage sales or on-line shopping groups. After obtaining the perfect cage, a good cleaning and a little touch-up paint and a proper locking system for monkeys is placed on the cage, then it is ready to build the habitat for the monkey that the cage is for. There are many different types of locks on bird cages or ferret cages. I like to always use a pad lock on my cages for safety and peace of mind. 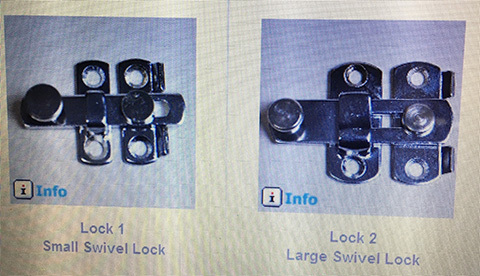 Replacement locks can be located on line. I like the ones that I order from www.kingscages.com. They sell the locks that can have a pad lock put on the cage. I hope this is helpful for you economy minded people or for you readers who need a replacement lock that you feel safer with. As you can see these nice replacement door locks come in two sizes and when slid to the right can have a pad lock placed on them. Most of the time when it is time to build the habitat for the monkey that the revamped cage was bought for, I already have an idea about what needs to go into the cage. My decisions are based first on the age, size and type of monkey that will be getting the cage. 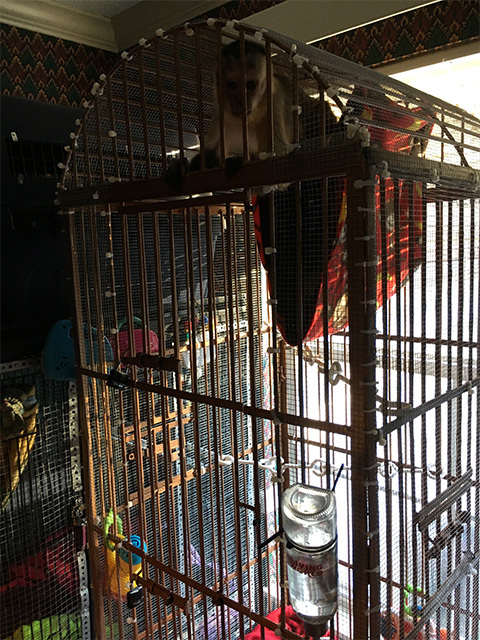 Since I have many re-homed monkeys, I must also take into consideration if they have had their teeth removed when planning their habitat and of course, the space that I have decided to place the cage when it is ready for the monkey. 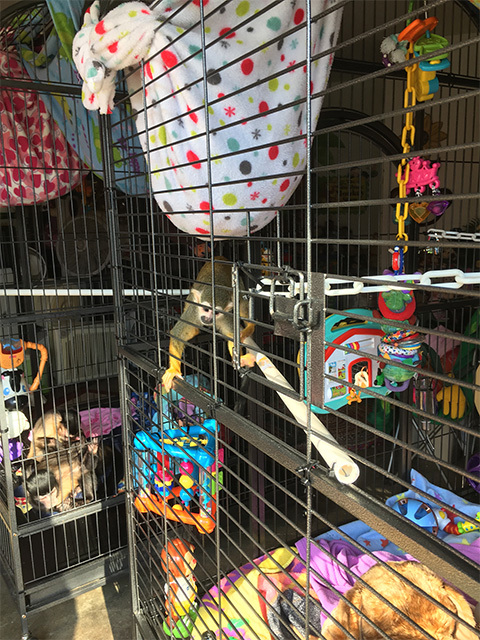 The Location Of Your Cage Is Very Important: You people who will be getting your cages for your pet monkeys will need to take into consideration many of the same things that I have mentioned in this section of this post. Of course, as your monkey grows you will wish to add either extra space to your cage or maybe obtain a larger one. The size of the cage is a very important part of raising a baby monkey. Too much space too soon can cause problems due to the monkey’s thinking that they have freedom before they have matured emotionally. You must be able to have the monkey come to you when you call them before you put them in a very large cage. When they do not come to you, they are not ready emotionally to go into a larger cage. Monkeys who live in captivity must get used to their worlds in captivity. So, gradual increases in the size of their play cages is best as they mature. This was one of the cages that I spent many months looking for. I was able to take this hand-made cage and turned it into being the perfect feeding cage for Pixie. Travel Cages/Crates: Selecting a small travel cage/crate is important to do when your baby monkey is small. Of course, these cages/crates will also change as the baby grows. It is so much easier to put them in these cages/crates when your baby monkey is on a Stuffie. It was not easy to place my Silly Willy in a travel cage (who my book is written about) because he was an arm monkey when he was little. I started giving him a treatie after he was taken off my arm and this began helping him with his tender feelings about separation from my arm. But this took time due to him only being nine weeks old when he came to me. I was so thankful for starting to do this in order to eventually get him to easily go into the travel cage. One of the things that many people will have problems with is remembering that monkeys have teeth, long arms, and love to pull things into their cage. I have lost many a strap to a new purse from forgetting that those little hands, arms, and teeth are very destructive and can pull things up to the grates of their cages and work those teeth and strong arms together and damage even the largest of items beyond being able to ever use them again. This is such a huge problem with my travel cages that I have put extreme effort into putting the smallest hole barriers over the cage doors and windows. This is also the way that I keep people from putting things into their cages when I take the monkeys out. Children will push sucker sticks, pieces of wood, toothpicks, and blades of grass in their cages when I turn my head. Even though they know to not come around the cages, sometimes I am amazed how quick they are there and gone. At least I have never had a child try to open up the cage. Thank goodness! The monks need so much supervision and this is more than with a child. It is okay to put a small child into a playpen or a baby pen and expect things to be great when you return. This is not necessarily true when you have a monkey. Accidents are the number one reason that captive monkeys pass away. It is hard to relax when you are a monkey caregiver, especially when they are babies. So, after you have decided about a beginning travel box or crate and their first cage, begin next to build the habitat for these areas. 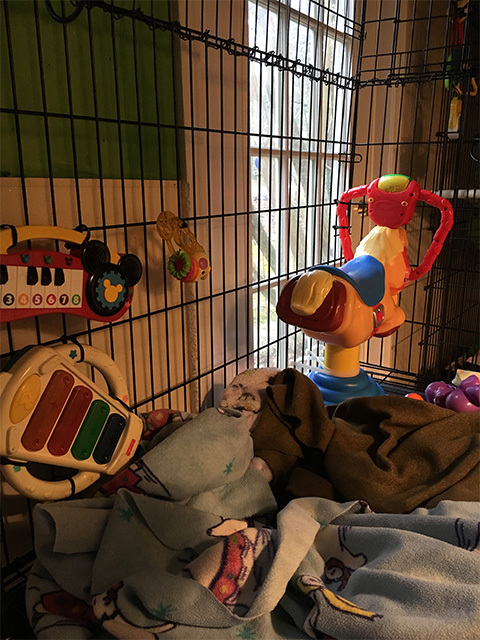 Choose what blanket or blankets that you will insert into the cages. Many baby monkeys come on Stuffies so remember that you will be placing this in the cages with them. 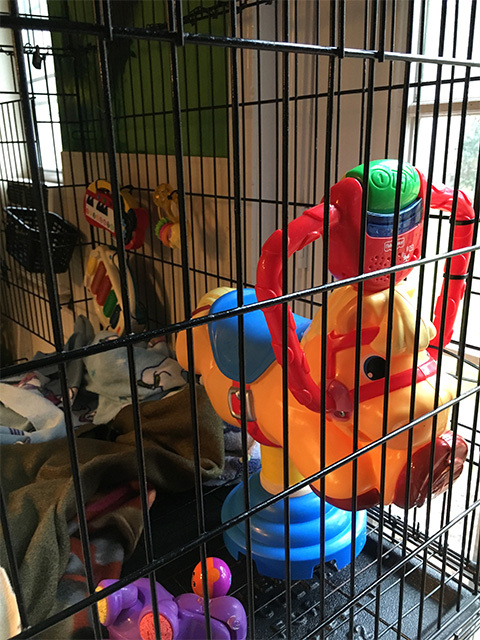 Choose the toys that will be in these cages from the toy guidelines that we showed you in the previous toy post. Always hang things low towards the bottom so they do not hurt themselves when and if they fall. Some baby monkeys come very active and then others come very sleepy and shy acting as they are enjoying their thumbs or hanging onto their Stuffies. As a monkey caregiver you may many times think that they like them more than they like you. UGH! Remember To Place Your Monkey’s Dearly Beloved Things In Their Travel Crate/Cage Or Their First Small Home Cage: Remembering these special things will make them love you (for sure) in their first days with you. One of the reasons that I use the phrase “Building A Habitat” for putting things into their cage is that I speak of the “monkey’s natural habitats” in my educational presentations. So, since we who are responsible for building their captive habitats we needed a phrase for doing this also. They can really love their lives with us in captivity and even though we cannot recreate their natural habitat, we certainly can be very creative with their fun spaces. I have always called this procedure “Building Their Habitat.” It is their special captive habitat and they certainly do enjoy them. So, now let me teach you how to add great things to your cages without spending a great amount of money. At a later time you may wish to change these types of things out for the other more expensive things but it does not matter what you may choose to do but now you will always know how to do it the old fashioned way. Nice branches for perches (USDA) requires these to be sanded and Polyurethane painted upon any wood that you place in a cage. I agree with doing this with any wood items that you are going to use. Now Create Your Very Own Habitat For Your Monkey: Below you will see photos of some of the cage habitats that I have built. These ideas are here to inspire you to do even better than I have done. Enjoy! Little Kizzy in her eating cage. “Cheech and Sissy Lou La La” visiting while their large cages are being cleaned. This is an extra eating cage that I keep ready for visiting monkeys. This is another view of the extra eating cage. I wanted to show you the bottom of the cage so that you would know what is necessary for you to have a cage that monkeys can have a space for diaper free time. Everything drops down upon the tray away from your monkey. It makes it become a hard clean up when this tray is not there. “Pincher’s” wide perch of PVC pipes. These pipes are secured with black electrical ties. We certainly hope that some of these ideas will help you when designing your monkey’s habitat. Get creative and enjoy every moment of creating for your monkey no matter what age they are. We certainly hope that you will share your creative space that you make for your monkey with us here at the Primate Store Site. I have always believed that it is an important thing for a monkey to be able to have diaper-less play time so they can learn to clean themselves and be free to explore their body’s. Try to make a time and space for them to always have diaper-less time everyday. Many people have shared with me that they really like giving their monkey free time without a diaper on after their bath time. Have fun when building spaces for your monkeys. Thank you for visiting us here at Primate Care. We are committed to bringing good information for you to think about and share with your family, friends, and other monkey caregivers. In the next posting on the Primate Care Site we will be talking more about traveling with your monkey and the use of travel cages.